What is the General’s Store Barbershop? Inspired by the simple set up of barbershops in India, The General’s Store began its humble beginnings in 2014 as a ‘pop-up’ venture in East London’s popular Netil Market. 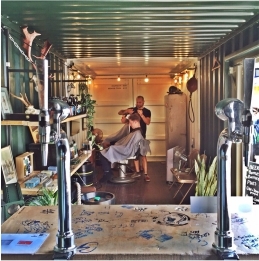 Operating from a single converted shipping container, this thriving little business resembling an old school barbershop offered clients top quality haircuts at affordable prices. It wasn’t just the value-for-money haircut, pampering, beard trimming or friendly service that grew this little enterprise though. Besides barber services, owner and co-founder Lee Wells, known as ‘The General’, serves clients his own home-brewed beer whilst treating them to a trim, cut-throat shave or beard comb, along with some decent conversation. 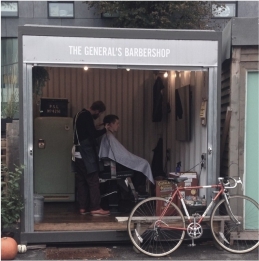 Instead of a traditional brick-and-mortar foundation, a single custom-built container was used to house the trendy barber-and-beer etablishment making The General’s Store sustainable and quite unique. The container conversion transformed a modular shipping container normally used for shipping or transporting goods into a thriving business providing an affordable workspace for the owner to realise his entrepreneurial journey. 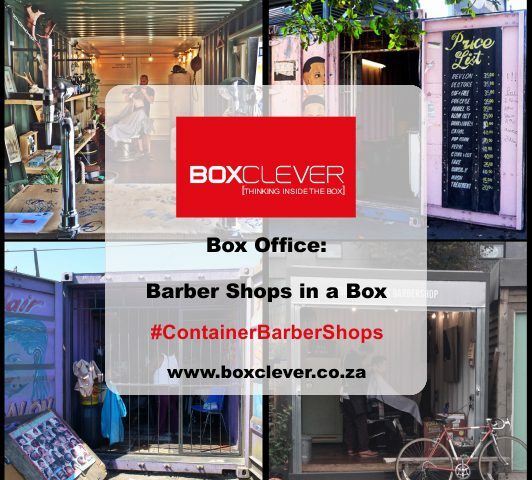 The shipping container was insulated to protect against the elements but its interior walls and roof were left exposed – giving the shop a quirky character. Two old fashioned barber chairs fitted comfortably into the modular structure and the talented men’s barbering specialist saw his small barber shop quickly grow. This growth culminated in the establishment of a bigger operation within the well-known custom bike store Bolt – situated in one of London’s railway arches in the district of London Fields. Here clients can experience the services of a professional barber whilst enjoying local beer or freshly brewed Italian coffee.